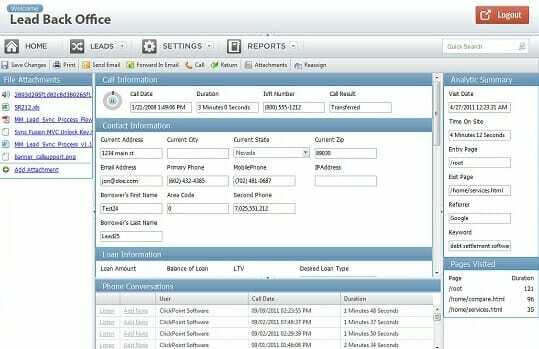 SCOTTSDALE, Arizona – November 16, 2011 – ClickPoint Software® today announced the launch of the new Client Portal for all LeadExec Users. This major update provides LeadExec customers with access to a fully featured lead management portal, giving users a completely integrated ecosystem to distribute and manage leads all with the same program. Access to the new Client Portal is completely free to all LeadExec customers, lowering the barrier to entry for Lead Generation companies to work with small lead buyers. The new Client Portal addresses the need for Lead Generation companies to work with smaller buyers of leads in order to mitigate risk and loss. Investing solely in one or two large accounts leaves Lead Generation companies vulnerable to a complete financial collapse should one of their large accounts decide to do business elsewhere. With the aid of the Client Portal, users will be able to grow their business quickly while also reducing risk and provide a valuable tool for their lead-buying customers. The new Client Portal has been designed with a simple interface that is easy for small size companies to understand, yet includes powerful advanced features that can propel the profitability of large corporations. ClickPoint Software’s goal has been to create the best software available for the Lead Generation industry at the lowest possible cost. This is done so every business has an equal opportunity to compete in the emerging field of lead generation and lead management. Response from the 150 beta testers of the Client Portal has been overwhelmingly positive. 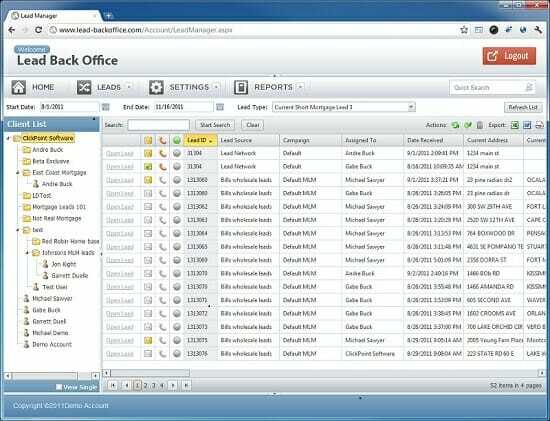 Major companies are deciding to forego the development of internal lead management software in favor of the ClickPoint Software Client Portal. By increasing lead transparency through the use of the Client Portal, companies will be better able to grade the effectiveness of current lead generation strategies and determine the best providers of lead sources for their particular business. Best of all, the Client Portal is completely free. There are no initial costs, nor are there any costs per seats. Users can create an unlimited number of individual accounts that can use the Client Portal to manage their sales leads. ClickPoint is the world’s premier software company in the field of Lead Management and Lead Distribution Software. With a goal to simplify lead distribution and lead management by creating user-friendly software that doesn’t compromise on performance, ClickPoint is changing the world’s view on lead management. This entry was posted in ClickPoint News and tagged press release on November 18, 2011 by Gabriel Buck.